SYNOPSIS: AVATAR takes us to a spectacular world beyond imagination, where a reluctant hero embarks on an epic adventure, ultimately fighting to save the alien world he has learned to call home. James Cameron, the Oscar-winning director of “Titanic,” first conceived the film 15 years ago, when the means to realize his vision did not exist yet. Now, after four years of production, AVATAR, a live action film with a new generation of special effects, delivers a fully immersive cinematic experience of a new kind, where the revolutionary technology invented to make the film disappears into the emotion of the characters and the sweep of the story. REVIEW: Col. Quaritch: You are not in Kansas anymore. You are on Pandora, ladies and gentleman. This is not just a movie, it’s an experience! I had been claiming Star Trek as the best movie of this year but now it has a serious challenger. You know that feeling you get after watching a movie and thinking to yourself, “Wow, I’ve never seen anything like that before!” Just like after seeing the Matrix for the first time. Well this one gave me that same feeling. This is unlike anything I’ve ever seen. Just the visual aspect alone makes it very much worthwhile so everything else is a bonus. And believe me, there is plenty more than just visual stimulation. There is action, adventure, mystery, love, courage, determination, pride, helplessness, and hope just to name a few. The story takes place in the year 2154 if I’m not mistaken so the high tech gadgetry is mind boggling on its own. The setting is extremely futuristic and yet primitive at the same time. There is an interesting balance between the two. As I watched this movie for reviewing purposes, it was extremely difficult for me to take my eyes off the screen to take any notes because it is that riveting. The visual aspects of this movie are mesmerizing. Seeing it in 3D is a must because you really feel like you are in this incredible world called Pandora. The usage of 3D is not blatant, abused, or corny but instead it is taken advantage of for its power to wrap you up and take you into the movie. I also claimed that if for nothing else Speed Racer should be commended for its use of color and visual excellence. Avatar tops it by far. From the beautiful eyes of the indigenous beings of Pandora to the various creatures and different landscapes, everything is simply breathtaking. The special effects used for this movie are truly top notch. So does this film stand up to the hype? You better believe it. James Cameron has done it again. Is it the next Titanic? Probably not, but in my opinion, it’s just as good only different. This is an epic movie that does have some similarities with such films as Last Samurai and District 9. This is not necessarily a bad thing. What helps give the movie depth is the people of this planet and the mystique that surrounds them. The cast that was assembled to present this story is decent and their respective performances are decent too, but nothing out of this world (pun intended). 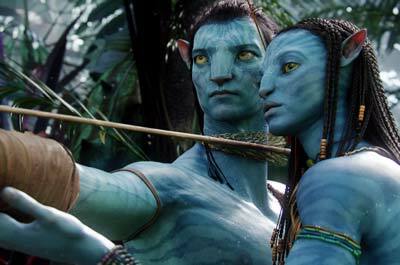 The performance I enjoyed the most was delivered by Zoe Saldana as Neytiri. She really brought that character to life. Is it coincidence that she was in Star Trek as well? Hmmm, interesting. Considering the unreal setting, the characters are actually very down to earth, or down to Pandora, and you easily become attached to them. The story itself is not exactly fresh but it is still effective. You might find yourself rooting for the underdog. This film also makes a strong socio-political statement but let’s not get all controversial now so we will just leave it at that. If you have read my reviews in the past you know that I tend to score high because I like to give every movie the benefit of the doubt plus I am a fan of movies more than a critic of them. If I give a 3 or lower the movie is not that good. But when I give a 5 star rating, you can be sure that the movie is good, great even. Go see this one and let me know if you agree with me. I highly recommend the 3D version. Enjoy the ride!